Barbara says she's here for the right reasons. $500: After displaying a warning screen, an iPhone will shut itself down until the situation normalizes in which of these cases? $1000: Traditionally sitting to the conductor's left and serving as their liaison to the other musicians, what term is commonly used to refer to a symphony's first-chair violinist? Barbara played violin for 12 years and was first chair for one year. $2000: Hoping to save the planet by changing eating habits, what non-profit campaign was launched by Paul, Mary and Stella McCartney in 2009? Barbara's husband is vegetarian and likes to mention when celebrities are also. $3000: Currently boasting about 60,000 objects in its collection, which Smithsonian museum's earliest offerings included an exhibit of traditional Chinese kites? Barbara started to eliminate A until she considered the other answers. $5000: What famous collection of poetry did Walt Whitman first publish anonymously in 1855? Barbara watched every episode of "Breaking Bad" and that helps. 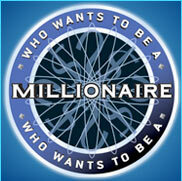 MILLIONAIRE "QUESTION OF THE DAY": The interior of a fiber-optic cable is usually made out of what substance? $7000: Given that the bases are all 90 feet apart, about how many full laps would you have to run around a baseball diamond in order to run one mile? Barbara loves baseball but wasn't expecting a baseball question and a math question at the same time. She knows a mile is slightly over 5,000 feet. She starts to divide the figures but opts to multiply instead. $10,000: Because today he uses his middle name as his last, Thomas Mapother IV is better known as what? Barbara will return on Monday.